I love me some Sam Spade and Mike Hammer. The lingo of the P.I. is so hypnotic, the opening narration of a dame sweeping into the smoke-filled office, slapping down a fat wad of cash as she demands that her husband be followed, that lousy two-timing no-goodnik. Okay, that's pretty outdated, but talk about "voice"! You get drawn right into the sights, smells, and sounds of the action, listening the to P.I. process all the details. 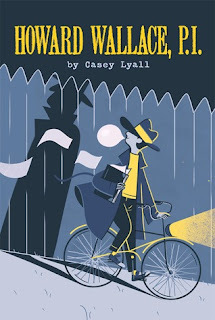 One of my favorite humorous middle-grade books of all time. 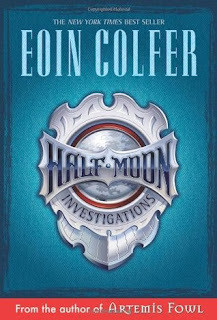 Fletcher Moon, nicknamed "Half-Moon" due to his height, runs a one-man detective agency. He's a hard-core, old-school tec that will solve your problem, whatever it is ... at the right price. 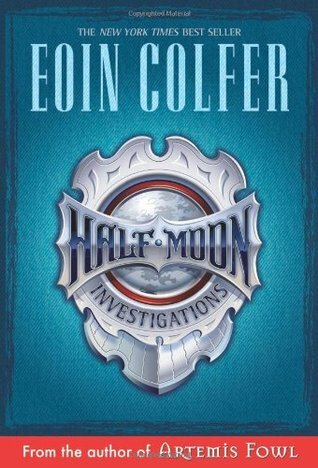 Along with an engaging mystery where Fletcher has to team up with one of his enemies, the HALF-MOON INVESTIGATIONS is a winner. "She didn't knock, just barged right through the door like she owned the place. She did own it, but that was beside the point. I told her to scram; a man's room is his castle. "Some mornings I should just keep my mouth shut." And later we find out that the trenchcoat he wears to make himself look like a P.I. ... is really an old brown bathrobe. There are so many hilarious moments like that. Kept me turning the pages. Well, that's all for me, toots. Whoops! I mean, good readers.